Each week, Big Issues focuses on a newly released comic book of significance. This week, it’s Victor LaValle’s Destroyer #6. Written by Victor LaValle (The Changeling, The Ballad Of Black Tom) with art by Dietrich Smith (Shaft: Imitation Of Life, Battlestar Galactica: The Death Of Apollo) and Joana LaFuente (Transformers: More Than Meets The Eye, The Hunt), this issue showcases how the creative team uses various genre influences to put a modern spin on Mary Shelley’s Frankenstein mythology. This review reveals major plot points. Modern interpretations of Mary Shelley’s Frankenstein aren’t hard to find, but Victor LaValle’s Destroyer builds something new from the classic horror story, using it as the foundation for a genre-bending thriller driven by social, political, and scientific commentary. The chills of body horror, the innovation of science fiction, the emotion of domestic drama, and the action of superhero stories all come together for this six-issue miniseries, exploring how two parents grieve the loss of their son, a 12-year-old black boy shot and killed by the police. Dr. Josephine Baker is the last descendant of Victor Frankenstein, and she uses a combination of advanced technology and her ancestor’s arcane discoveries to bring her dead son, Akai, back to life. Meanwhile, the shadowy organization that used to employ Josephine is in the midst of its own search for immortality, tracking down Frankenstein’s Monster in Antarctica and bringing him back to civilization. The Monster is dedicated to wiping out the bloodline of his creator, paving a path of carnage as he makes his way toward Josephine and her resurrected child. That scene was in last month’s issue, which makes the strongest statement about how American society perceives black citizens as a threat by revealing what led to Akai being gunned down only two seconds after the police officers pulled up to his location. Walking to the bus stop from his Little League game with his baseball bat resting on his shoulder, Akai is presumed to be an adult man carrying a rifle by a local resident, who calls the police and sets off a tragic sequence of events. In his short essay in the back of the issue, LaValle writes about how this is the most important moment of the entire story, which wouldn’t exist without that phone call. He connects this to a 2015 incident in which a 57-year-old Indian man, Sureshbhai Patel, was tackled by a police officer after an anonymous neighbor called the police on him. LaValle points out that while the brutalizers in these situations are often discussed, there needs to be a conversation about the people who view their neighbors of color as a danger to their community and get the police involved without understanding the potential consequences. Destroyer isn’t just about police brutality; it’s about the racism within communities that facilitates that brutality. LaValle works primarily as a novelist, but he avoids the traps many novelists-turned-comics writers fall into with the transition. He doesn’t bog the script down with narration, instead letting dialogue drive the storytelling. He knows when to step back and shine a spotlight on Dietrich Smith’s and Joana LaFuente’s artwork, and he takes advantage of the ability to depict quick, forceful action in comics to keep the book moving. Destroyer addresses some very heavy subject matter, but LaValle never lets seriousness take over the narrative. He consistently finds moments of levity, providing necessary contrast that intensifies the dramatic moments. In the final issue, Josephine comments on how mothers are weighed against fathers on a broken scale when she sees how quickly Akai accepts his absent father. The conversation continues with a panel showing Lady Justice holding Josephine and her husband on those scales, and when Josephine gets defensive, Lady Justice pipes up to say, “She’s so shrill.” The book features a few of these shifts into more figurative storytelling, and they show LaValle’s understanding of comics as a medium that can illuminate dialogue with visuals that break from reality. The Bride is another great example of this book’s sense of humor, reimagining the Bride Of Frankenstein as a hulking mech suit that bonds completely with its pilot. In a clever design touch, white stripes along the top of the machine evoke the electrified hair of the cinematic Bride Of Frankenstein. The playfulness at the root of this idea is refreshing in the middle of a story that goes to some very bleak places. Smith has been working in comics for more than 20 years, and he’s found a sweet spot between realistic and cartoonish drawing on Destroyer. Environments, objects, and clothing are presented in crisp detail, but he exaggerates the characters’ facial expressions, making their emotional shifts exceptionally clear. Smith’s experience in animation is an advantage for his comics work: Because animation places simplified moving figures in front of lush backgrounds, he’s able to incorporate photo backgrounds into his artwork without it being jarring. The action in this book is also spectacular, and Frankenstein’s Monster annihilates the people and places that get in his way with frightening ease. LaFuente’s muted, chilly palette reinforces the somber elements of the narrative, but she uses bursts of brighter colors to energize those action sequences. 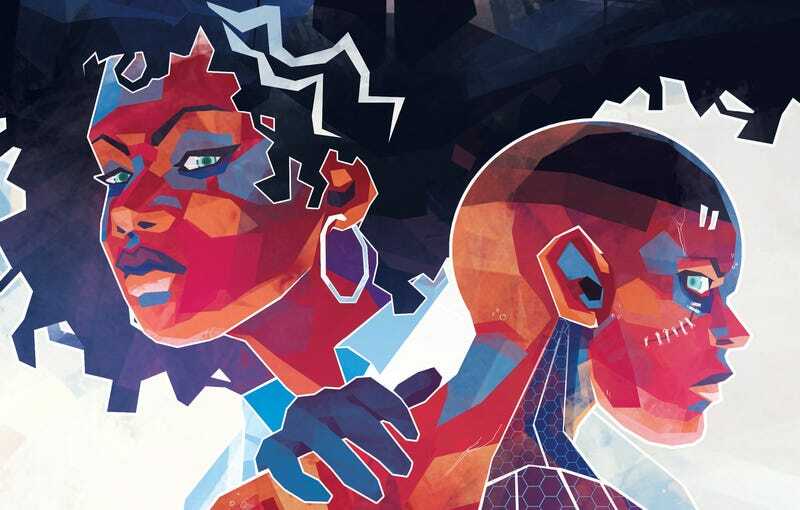 Destroyer is a response to current events, and LaValle has homed in on issues that are going to be an ongoing concern, making this story relevant for years to come. This final issue was most likely written when the Civil War monument debate was raging over the summer, but it has new resonance this week after John F. Kelly’s comments about how “the lack of an ability to compromise” led to the Civil War. There is no room for compromise when the conflict revolves around the enslavement of people, and given the ongoing, systemic oppression of black Americans, compromise isn’t an option in the present either. Josephine has hit her breaking point, and she wants to completely dismantle the system that has shown her time and again that it has no intention of serving and protecting people like her and her family. When her husband says that she acts like things haven’t changed since the Civil War, Josephine responds, “This whole damn country is one big Civil War monument. It’s time to tear it down.” Bolded lettering is often used to show vocal intonation, but in this case, letterer Jim Campbell uses it to visually link separate phrases and give them more prominence in the panel. That panel shows Josephine looking like a supervillain as she looms over a burning White House, giving readers a strong impression of the vengeful rage within her that cannot be quelled. The time has passed for compromise and peaceful protest. She fully embraces her role as the destroyer, but she also dooms herself in the process.